Unlike some exotic pets (especially reptiles), African dwarf frogs don't need any special (and expensive) lights like UVB lamps, heat lamps, or basking lamps. But they do need regular periods of "day" and "night" which you, as their keeper, have to provide through controlling their lighting. They should have at least eight hours of "daylight" every day, and darkness or subdued light for the rest of the 24-hour cycle. I personally give my frogs 12 hours of day and 12 hours of night. They've never complained to me about it, so I guess they're happy with that. As I've already mentioned, you don't need any special kind of lights for ADFs. Any standard aquarium light will do. I personally like LED aquarium lights because they put out good light, they use almost no electricity, and they're low-voltage. That's a big benefit in a light that's used so close to water. LED lights also won't shatter if they're splashed with water. In fact, some of them are submersible. If you have live plants in your aquarium, you may want to use a full-spectrum aquarium plant light. Most "beginner" level aquarium plants will do well enough with ordinary aquarium lighting, but if you consider the aquascaping to be part of your hobby, then you'll probably want to use a plant light to encourage the plants to grow their best. Whichever kind of lights you choose, you should consider controlling them with an aquarium light timer that will turn them on and off every day at the times you select. If you use a night-light in your frog tank, there are dual, day-night timers like this one that will turn the night light on at the same time they turn the day lights off. Most of them are sold for the reptile hobby because many reptiles need heat lamps at night. But they work just as well for any habitat where you want the timer to control both the day and night lighting. Make sure not to plug your heater, air pump, or filter into the timed outlets. Those devices should be left on 24/7. The timer should control only the lights. Also, resist the temptation to use non-aquarium timers to control the lights in your frog tank unless the timer is so far away from the tank that it can't possibly be splashed by water. Non-aquarium timers are not designed to be splash-resistant. African dwarf frog habitats almost always need heat. Like all amphibians, frogs are "cold-blooded" and can't regulate their own body temperatures. As their keeper, you have to do it by regulating the water temperature. African dwarf frogs prefer a temperature of about 78 F (about 26 C), and they need a temperature of at least 75 F (about 24 C). If the temperature drops much lower than that, your frogs won't be able to carry out essential metabolic processes like digesting and using the energy from food. If the temperature stays too cold for too long, your frogs will get sick and die. In order to keep the water temperatures in the 75 - 78 F ( 24 - 26 C) range without a heater, the room temperature would have to be about 80 F (about 27 C) or warmer. Very few people keep their homes that warm. Therefore, if you're like most people, your ADF habitat needs an aquarium heater to keep the water warm enough for the frogs to be healthy and happy. The most common aquarium heaters are submersible ones that must be installed inside the tank, surrounded by water. If they're turned on while out of the water, they will burn out. Reputation and Reliability. If there's any one aquarium item where reputation matters, that would be heaters. Think about it: You're taking an electrical device and immersing it in a tank of water. That's not something I want to do with a no-name device. That's also why I like buying my aquarium heaters from Amazon. I limit my search to aquarium heaters that have average reviews of four stars or better. That helps filter out the heaters that other buyers have had problems with. Proper Voltage. If ordering a heater online, make sure to order one that works your local electrical supply voltage. In North America, that would be 110 - 120 volts. Physical Size. Make sure that submersible heaters are not too big to fit in the tank fully submerged. Sufficient Capacity. Aquarium heaters are rated in watts. They also usually have a recommendation for what size tanks they can be used in. Those recommendations are based on the assumption that you'll only be raising the water temperature about 6 degrees F (about 3.3 degrees C) over room temperature. So if you want to heat the water to about 78 F (about 26 C), your room temperature would have to be about 72 F (about 22 C) for the minimum-rated heater for your tank size to keep the water warm enough. If you keep the room cooler, then you need to move up to a more powerful heater. The difference in overall power use from using a higher-wattage heater in your African dwarf frog tank will be very little. Aquarium heaters are thermostatically-controlled, so they only come on when the water gets too cold. When the water is warmed up, the heater turns itself off. So even though a hundred-watt heater uses twice as much electricity as a 50-watt heater does, it will only stay on about half as long. It's also likely to last longer, for the same reason. Here are my recommendations for aquarium heater wattage for an African dwarf frog tank of various popular sizes. I am assuming that we're keeping the water at the frogs' preferred temperature of about 78 F (26 C), and that the room temperature is about 68 F (20 C), which I think is a realistic scenario. My recommendations are higher than most people's because I've found that going a bit higher than what's minimally needed tends to extend the life of the heater. I'm also assuming what I believe is a more realistic room temperature. If you keep your home warmer than 68 F (20 C), then you can probably get away with a lower-wattage heater. If you keep it colder than that, then you'll probably need a higher-wattage heater. It all comes down to the size of the tank and the difference between room temperature and the desired water temperature. You may want to use two heaters in your tank so if one burns out, the other will be able to keep the tank warm until you can get a replacement for the burned-out one. If you decide to use multiple heaters, then the sum of the heaters' wattage is what matters. Two 50-watt heaters will put out as much heat as one 100-watt heater, so just add up the wattages of all your heaters. If you decide to use only one heater, then you may want to keep a spare on hand. They do burn out eventually. No space inside the tank is lost to an internal heater. It may be more visually attractive because there's no heater hanging in the tank. 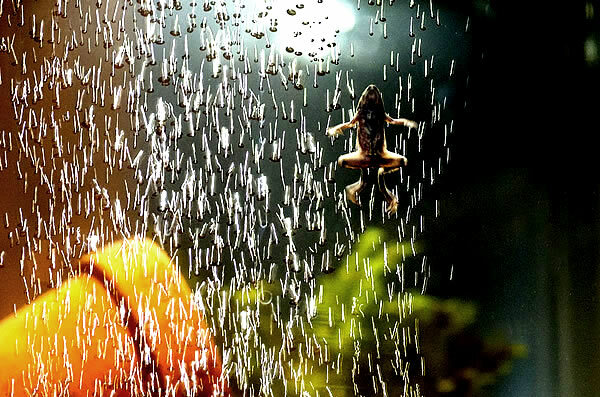 The chance of a frog or other resident of the tank being burned by the heater is eliminated. The main disadvantage is cost. In-line heaters tend to be more expensive than submersible heaters. When choosing an in-line heater, you have to consider not only the tank size, but also the flow rate of the filter. Using a heater that's rated for a lower flow rate than what your filter delivers will result in the water passing through the heater too quickly to be heated. You also must make sure that the heater's fittings will fit the size and type of hose that your filter uses. In addition to a heater, you also need an aquarium thermometer. Heaters do malfunction, so you need a way to monitor the water temperature. Here are some of the more common types of aquarium thermostats. Stick-on LCD Thermometers. Stick-on aquarium thermometers simply get stuck to the glass on the outside of the tank. They're inexpensive, easy to use, and easy to read. They're not as accurate as some of the other types of thermometers, but they're accurate enough for most habitats. Glass Internal Thermometers. These thermometers are accurate, but can be difficult to read. They're either stuck to the interior glass of the tank with suction cups or allowed to float in the water. They used to be the standard for aquarium thermometers, but they're getting less popular. Electronic Aquarium Thermometers. Electronic aquarium thermometers are either waterproof and mount inside the tank, or they have a probe that goes inside the tank with a display unit that remains outside the tank. Some of them are able to control an internal or external heater if you don't want to use the heater's built-in thermostat (or if it doesn't have one). Unless you need precise control over water temperature for some reason (such as breeding), any of the above thermometers should work fine. The important thing is that you have a thermometer. Heaters do fail. Sometimes they get too hot, and sometimes they stop working at all. Your thermometer lets you know if your heater has malfunctioned or died.